Ponmudi hill-station is a place for nature lovers. Located in Thiruvanathapuram, the enchanting hill station Ponmudi is best-known for its carpet of thick tropical forest rolling down to the foothills. It is placed at a height of 1000m and is one of the highest hill-stations in Thiruvananthapuram. Whether it is a nature lover or adventure enthusiast, Ponmudi doesn’t seem to disappoint any of its visitors. It has something for every traveler. A nature lover can adore the attractive landscape surrounded by lush velvet meadows for hours and adventure lover can try out some thrilling activities like trekking in the green jungles and camping. Bird lovers here can spot native and migratory birds. Also, the hill-station is home to the endangered Nilgiri Tahr. A walk through tea plantations here fills your senses with the rich fragrant aroma of tea. Ponmudi literally means ‘The Golden Peak’. The route to Ponmudi is amazing as you would come across several hairpin-bends, sharp climbs and foggy routes. There are a number of tourist places of interest to visit in Ponmudi hill-station such as Peppara Wildlife Sanctuary, Agasthyamalai Biosphere Reserve and Meenmutty Falls. Other prime attractions are Ponmudi Falls, Deer Park and River Kallar. Ponmudi hill-station is also renowned for its oldest rejuvenation therapies of Ayurveda. The best time to plan a trip to Ponmudi is from October to March as during this time weather here is perfectly fine and appropriate for sightseeing. You may also opt to travel to this hill station just after monsoon; when the lush greenery of the place sprouts entirely. Moreover, Ponmudi is well-connected via rail, road and air. Trivandrum International Airport is the nearest airport (58km away) and Thiruvananthapuram Railway Station is the nearest railway station (55km away) .There are several scheduled buses available to Ponmudi from Thiruvananthapuram and Kerala. 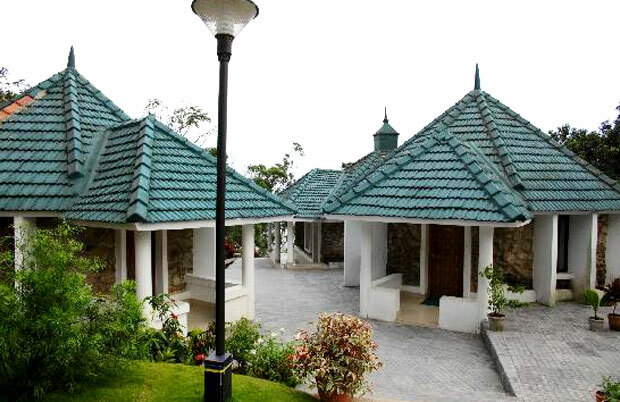 Located amidst the beautiful Ponmudi hills, the Golden Peak hill resort is more than just a holiday . . . Read More..